Registration is the process of enrolling in courses and obtaining your schedule for the next term. Registration is required before a student can attend classes. Students can register online through RaiderNet. For information regarding important dates, visit the Academic Year Calendar online. 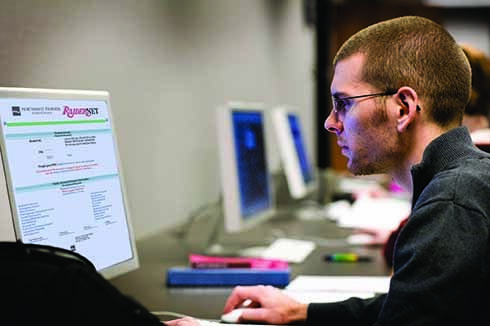 Students may register by computer via the college website or in person at any of our campus locations. Any student who has previously attended the college, and who has not been in attendance within one academic year, must reapply online at www.nwfsc.edu/admissions to update personal data, verify education goals, and residency. Students are classified according to the number of semester hours they have earned. The maximum load that may be carried by a student each term is eighteen (18) credit hours. Students seeking to enroll in more than eighteen (18) developmental, vocational, and/or college credits in a single term must have the prior approval of an advisor. Students registering in a college-credit course on a “not-for-credit” basis will be enrolled in an audit status. Upon completion of the course, an “X” grade will be awarded with no impact on the student’s GPA. Students may elect to change to audit after the end of the advertised drop/add period. An “XC” will count as an attempt toward full cost of instruction/repeat rules. Students auditing a class are not required to complete examinations but are expected to attend classes and participate in other activities and requirements on the same basis as students seeking credit. Some occupational courses may not be available on an audit basis. Students wishing to audit an occupational course must obtain permission in advance from the appropriate department head or division director. Audit enrollment in studio art classes is permitted on a space-available basis only. Students may audit a class no more than four (4) times. Changes in courses or sections may be made during the schedule adjustment period specified in the college calendar. Any such change can be accomplished either in person, by completing and processing the required forms at any NWF State College campus or center, or by logging on to RaiderNet. If a student withdraws from a course within the established schedule adjustment period, the transaction is considered dropping a course and no record of the enrollment will appear on the student’s transcript, nor will the enrollment count as an attempt for purposes of full cost or repeat rules. Students are permitted a maximum of two withdrawals per course in college credit, vocational or developmental courses. Upon the third and any subsequent attempt in such a course, the student will not be permitted to withdraw and will receive a grade for the course. A student-initiated withdrawal can be processed up to the withdrawal deadline posted in the College Calendar. Withdraws can be completed using RaiderNet or by submitting a signed withdrawal form at the registration desk at any campus or center. If the student has not exceeded the approved number of withdrawals, the student will receive a grade of “W” on his/her transcript. A currently enrolled student may completely withdraw from all of their classes up to the withdrawal deadline posted in the College Calendar and, thus, will no longer be considered a current student. The transcript will reflect a grade of a “W” for all currently enrolled classes. The student must first consult with an Academic Advisor to complete the process. Financial Aid recipients and student athletes must check with their appropriate representative(s) to determine financial ramifications for withdrawing, if applicable. Students may be administratively withdrawn from the College for reasons such as violation of college policies, procedures, student code of conduct, or for other mitigating circumstances. The Vice President of Academic Affairs or the Dean of Students can administratively withdraw a student at any time. Instructors may withdraw students who do not attend during the first week of class.